History's greatest composer stood alone in his work. He composed more than 1,800 pieces of music. Once he did a work with 53 parts and arranged those parts in seven places around a sanctuary to create surround sound and a total delight to the senses. He was born in the same town as Martin Luther and followed his teaching. Bach loved the Lord and he believed the book of Ecclesiastes told us to do our work with joy unto the Lord. That he did. I first picked out this book to review because we are studying Bach in homeschool. I have loved his music for some time, but now I find myself mystified by the man. He was brilliant, fun, caring, family oriented, and whole-heartedly devoted to the Lord. 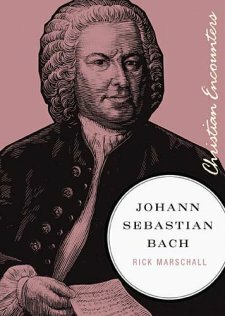 Truly, Bach was a rare man. It seemed that the more complicated a piece of music or an instrument was, the more he reveled in it. Yet, he was friendly and cheerful (wig on and wig off). Every piece of music he wrote was started with the words "Jesu, Juva" (Jesus, help me) and ended with "Soli deo gloria" (to God be the glory). His life was marked over and over by his desire to glorify the Lord in life and music earning him the title "The Fifth Evangelist." The biographer even stated that his life had a brilliant sunset. So few gifted men finish well. Bach was an exception. Through his work, legacy, and twenty children, he has impacted all sectors of music. His ethic and creativity were masterful. I enjoyed learning about the man behind the music more than I can say. I highly recommend this book. This book was graciously provided by Thomas Nelson for review. I also enjoyed the biography of Jane Austen in this series.